We made vegan cream cheese and now we’re going to do something awesome with it. Are you ready? It’s one of my favorite dairy-free recipes to date! You’re going to start by making a walnut-based crust. It’s just four ingredients, none of which are dried fruit. As much as I love the no bake crusts that use dried fruit and nuts, I wanted to do something different with this and ended up finding walnut flour in the process! Then, you’re going to make cranberry sauce. A bit of orange zest here, some boiling there, it’s a cinch. Lastly, you’re going to mix your awesome, homemade, vegan cream cheese with some vanilla, coconut nectar, and BAM. Layer it all up, stick it in the fridge and you’re good to go. The most painful part of the whole process is limiting yourself to one two squares per day. Hey, it’s Christmas, we could all do with learning to embrace our indulgences. If you do dairy, try using goat’s milk cream cheese instead of the regular run of the mill cream cheese. It adds bold flavor to these already delicious squares. I made two versions of this recipe, one with my homemade cream cheese and the other with Happy Days Plain Goat Cheese Spread (all images are of the vegan version) and was surprised at how darn similar the two were. Aside from the bold taste that is goat cheese, each batch performed so similarly and the consistency was like for like. Score! For the lactose-reduced, dairy-based recipe, head on over to the Happy Days Inspirations page. For the vegan version, scroll down and commit to making this during the holidays. Oh man, just commit. 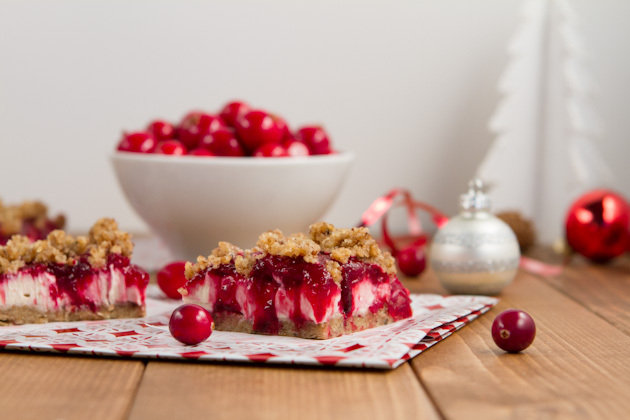 Dairy-free, gluten-free cheesecake made with homemade vegan cream cheese layered between a grain-free base cookie base and a homemade cranberry orange sauce. 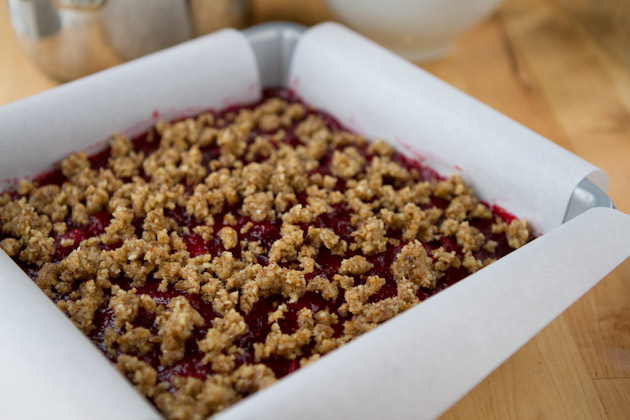 Line an 8x8 pan with parchment paper draped over each side for easy lifting. Set aside. Combine all cookie base ingredients in a bowl and mash with a fork until well combined. You'll know the mixture is ready when it forms into a ball easily. Reserve ¼ cup of the mix and press the rest into the prepared pan. Make sure it's nice and compacted and flat. Place in the fridge. 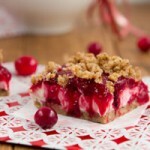 Then, prepare cranberry orange filling. Combine all ingredients in a small saucepan. Bring to a boil, uncovered on medium heat, stirring often. Reduce heat to low and simmer for 10-12 minutes until mixture has thickened. You want it to be about the same consistency of cranberry sauce, a bit thicker. Remove from heat and allow to cool for 20 minutes. Then, combine all cream cheese filling ingredients in a small bowl. Whisk to combine until smooth. Remove the cookie base pan out of the fridge, top with cream cheese mixture and smooth out with the back of a spoon. 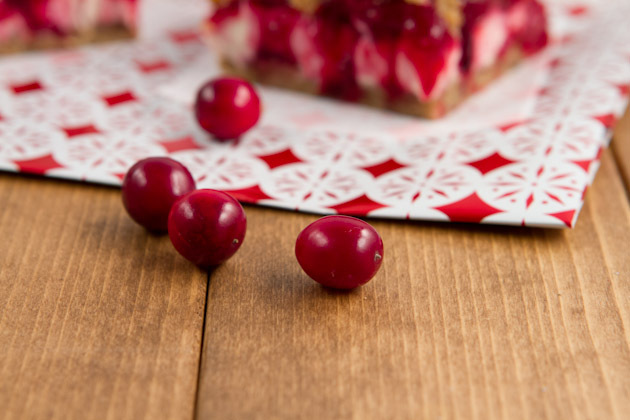 Return back to the fridge until the cranberry mixture has cooled. Top the cream cheese layer with cranberry sauce, removing the cinnamon stick before doing so. To do this, drop mounds of the sauce all over the pan so that you don't have to spread the sauce to far along the top of the cream cheese. This will help you avoid mixing the two layers together. Go gently. 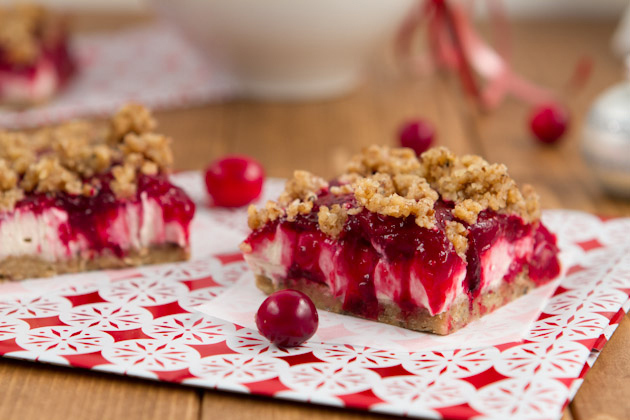 Once the cranberry layer is smoothed, combine the reserved ¼ cup cookie base mix with an additional 2 tablespoons of ground walnuts. Sprinkle over the top of the pan. Cover the pan with plastic wrap and allow to chill overnight. I left it for 24 hours. When ready to serve, lift out of the pan with the edges of the parchment paper and cut into 12 squares with a sharp knife, cleaning the knife between each cut to maintain the colors and layers of the squares. For the walnut flour - make you own by adding raw walnuts to your food processor and breaking down into a flour. That, or you could try replacing the walnut flour at a one to one ratio with almond flour. For a grain-based option, try the base from this recipe. For the coconut nectar - other liquid sweeteners could be used like honey (no longer vegan) or date syrup. Will keep for 4 days in the fridge. Can be cut into squares and then frozen for up to 1 month. 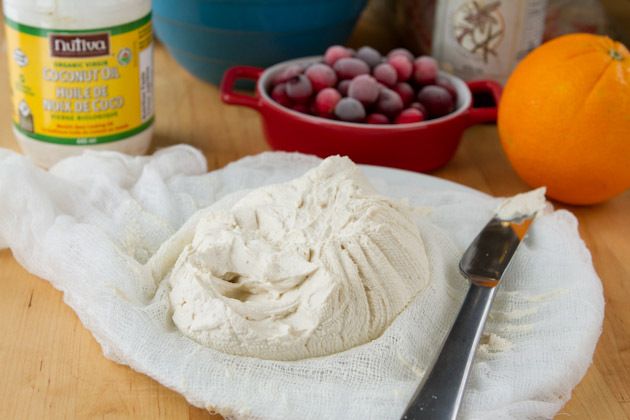 Begin by making a batch of vegan cream cheese or, grab a couple of containers of Happy Days Plain Goat Cheese Spread and follow the goat cheese-based instructions here. You want to mash the base ingredients with a fork, or your hands, until everything is combined well. When it’s ready, the mixture will form into a ball really nicely. Reserve 1/4 cup of the mix and press the rest into the parchment paper lined baking pan. I like using parchment paper because it makes lifting and cutting the squares so much easier than if you just press it into the pan. This is a necessary step! Get your sauce ready by adding all of the ingredients to the saucepan. It may look like there isn’t a lot of liquid in the pan but the berries will pop and everything will work out. Just stir and keep a smile on your face… and try not to snack on too much sauce. I was down at least 2 tablespoons come the end of the process. 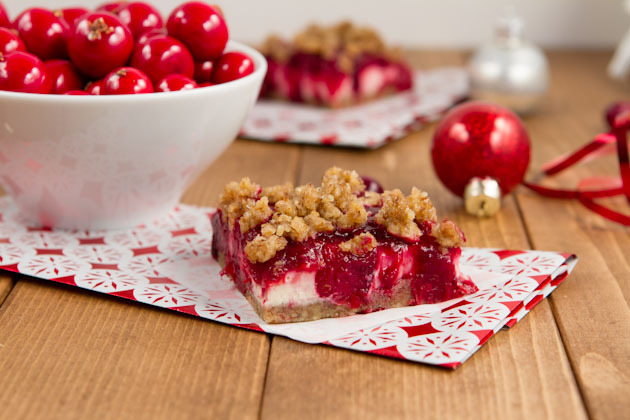 While the cranberry sauce is hanging out, you can get the cream cheese ready. Add the ingredients, stir with a spoon and plop onto the walnut base. Get it real smooth and refrigerate. Then add the cranberry sauce. Smooth it out gently. Don’t go too fast here or you’ll end up combining the layers and making a hot mess of everything. Add reserved mixture with the extra 2 tablespoons of walnut flour mixed in. Crumble it between your fingers as it falls to the pan. Refrigerate overnight, cut and dig in! An old friend of mine offered to share her last buddy passes with me so that I could go home to Calgary for a little while. I’ve wanted so badly to hug my daddy, stay up late with my little sister, and head to the spa with my mom for a pedicure. My soul needs this trip so badly and I’m so lucky that I’m in a position to just be able to pick up and go. I’m blown away by the kindness and thoughtfulness that went into this little miracle I’ve been gifted with. I am so very grateful! It doesn’t matter how big, or small, even if it’s opening a door for someone, or offering to help shovel and neighbors driveway, we all have the ability to create these little miracles for others. After this morning’s yoga class I’m packing up my bags, kissing Kevin and the puppies goodbye and heading home for a while!